Dive into the deep blue ocean for a tonic that adds incredible zest to your life. If that sounds crazy and far- fetched, then just pop up two capsules a day for a booster that energizes you all through the day. Wondering about the capsules in question? Read on to know more about a healthy dietary supplement that can add more zeal to your everyday living. In one post Jashmi share about Oriflame Wellness Soup and today I will share about something new! Diet, exercise and living a healthy lifestyle are key ingredients to staying fit and in shape. But there are limitations to the amount of nutrition one receives from the food consumed. And one such nutrient lacking in your everyday diet is Omega 3 fatty acids. Known for its health and beauty benefits, this essential ingredient can be accessed by simply purchasing and consuming Oriflame Wellness Omega 3 Capsule available in an easy to carry travel friendly plastic bottle containing 60 capsules for your monthly Omega 3 supply. Oriflame is known for sourcing the best ingredients to ensure you don’t just feel healthy from outside but build yourself from within. Therefore, it uses the finest quality fish oil from natural and sustainable sources to ensure you look young and stay invigorated. Studies show that it also enhances your brain function thus helping you concentrate in your day-to-day activity, builds your cardiovascular health by protecting your heart and increases the moisture content in your skin – something you would love to experience especially during the current winter chills. A regular intake of Omega 3 Capsules can help you strengthen your heart’s health by maintaining cholesterol levels and keep multiple heart diseases like diabetes, hypertension and other complications at bay. Build your skin cells by providing elasticity and improved moisture to arrest the signs of aging that robs your youthfulness. Make Omega 3 a part of your daily wellness routine. Don’t just stay young at heart, but feel that way too! As time progresses, your muscle wear and tear reduces due to all the stresses your body handles as part of routine activity. This capsule can help protect your muscles and joint by decreasing the incidence of inflammation or pain and swelling due to injuries or infection. You can now say goodbye to stiffness of the bones and muscles. You can also help improve another person’s quality of life by gifting or suggesting the consumption of Oriflame Wellness Omega 3 Capsule. It is beneficial for pregnant women in the development of the fetus, asthma patients and also relieves depression and other mental disorders. Omega 3 helps protect eyes from blindness and helps alleviate cramps related to menstruation. It can also help prevent memory loss, Alzheimer’s Disease and the onset of breast and prostate cancer. A capsule filled with so many advantages, it sure is an essential to be added in your next shopping list. Give your loved ones some tender love and care with the added vitality derived from your regular intake of Oriflame Omega 3 Capsule because each moment of your life is meant to be lived to the fullest and with lots of positive energy! 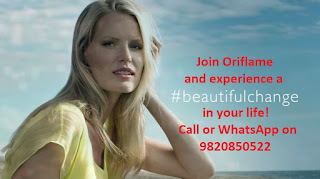 To know more or purchase any of the Oriflame products, do contact Jashmi Wagela on 9820850522 through Whatsapp. Nicely Explained, Do check my post as well for Omega 3!